Sophisticated Painted Finishes, Jewelry and Eclectic finds from around the world. 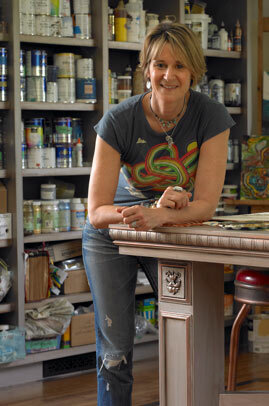 Cynthia Davis has been a decorative artist since 1993. She has a Bachelor of Arts Degree from the University of Vermont, and has studied with The Museum of Fine Arts, Boston, Pratt University, N.Y. Silvermine Artist Guild, Ct. Brookfield Art Center, Pierre Finkelstein Painting Institute, NY, Sepp Leaf. NY. 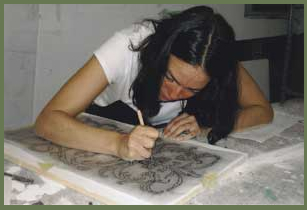 She has studied in Europe with Vigini Studios of San Antonio, Texas and The Bottega D’Arte, Florence, Italy to keep on top of the latest design trends and finishes and she has taught decorative painting nationally at several design studios. She has also traveled to Europe with Prismatic Painting Studios of Cinncinnati Ohio, where she worked on a design team to faux paint a 18 room Chateaux in France. Cynthia is a member of IDAL, The International Decorative Artisans League. She is co-founder of Wallovers, a company offering over 50 “allover” stencil designs and the creator of “the topper” and the “Wallbuster” stencil brush. Cynthia earned her Masters Degree in Service Leadership Management in 2015 from The School of International Training in Brattleboro, Vermont. She uses her intercultural service leadership and creative skills to help educate and empower women who have been victims of war and genocide. Rena Paris has been working with Cynthia Davis Designs since 1996 . She has a Bachelor of Arts in Studio Art from SUNY Binghamton. Rena loves to faux finish, handpaint and stencil. She is meticulous and precise and never takes a break. Her contributions with regard to color and design enhance every job we are on. In her spare time Rena creates her own painted pottery, handmade papers and soaps. Rena is also the co-founder of Wallovers along with Cynthia. Catherine Bourassa is our studio Manager. Although she is part time you will often hear from her if we need to contact you and if you need something from us you might gether friendly, passionate voice on the other end of the phone. Catherine also assists on decorative painting jobs and at our trade shows for Wallovers. She is a well informed member of our team and an inspiring writer as well.